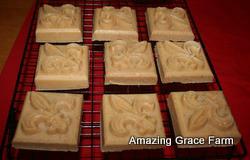 Goat milk is renowned for it moisturizing abilities, while still being gentle and hypo allergenic, perfect for soap. 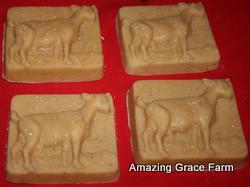 We create our soap with fresh milk, essential oils, herbs, and the most natural ingredients possible. 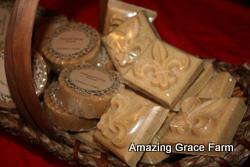 Making it perfect for sensitive skin. 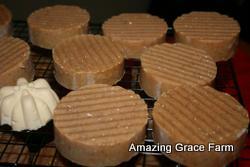 Our soap is smooth, with a luxurious lather, leaving soft and squeaky clean skin. Buck Bar (manly scent or universal, I like it! 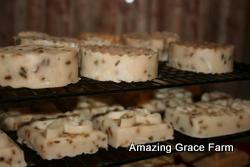 ), Citrus Summer , Emily's Spiced Oatmeal, Eucalyptus/Peppermint, Lavender/Honeysuckle, Lavender, Oatmeal Honey, Poison Ivy Bar (Jewelweed), Tea Tree Cleanse, Thick as Thieves, Unscented, Green Tea Sea Clay, and Charcoal Bar. 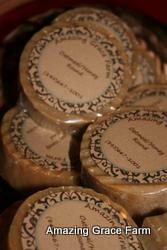 Label customization available on our soaps & lotions for weddings/baby showers favors!! Just make a note in the comments box! ** DON'T forget to add shipping to your cart, if you're not local enough to pick up! Your order will be delayed until shipping costs are recieved. 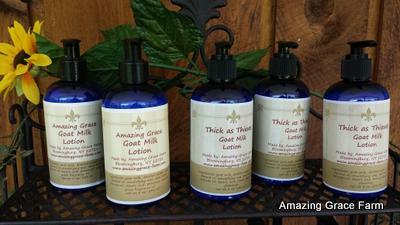 Our goat milk lotion is thick and creamy, providing ultimate moisture. We dislike greasy lotion just as much as the next person we so make sure our lotions absorb right into the skin. We have an ever growing and varied range of varieties, from non scented for the the most sensitive skin types, to earthy Lavender perfect for reducing the appearance of scars, to Citrus Summer, a bright scent of lemongrass and jasmine. 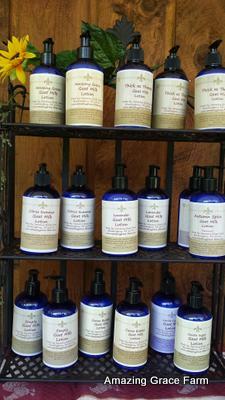 We add essential oils to our lotion in small amounts so as to create gentle background scents that aren't overpowering. 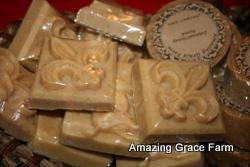 Non-Scented, Lavender, Citrus Summer, Cocoa Butter, Vanilla Sugar (Cocoa Butter base), Amazing Grace (floral musk), Thick as Thieves, & Peppermint/Eucalyptus. Everyone is into natural lip balms these days, but those little tubes can be expensive! And many times the feeling of moisture only lasts for a little while. Our balms have a few simple ingredients that work together to provide the perfect long lasting moisture for your lips. Made with all food grade ingredients, flavors and natural colors, our lip balm is safe enough even for the kiddos to use. 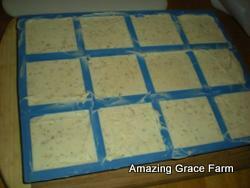 Peppermint, Watermelon, Pina-Colada, and Simply Moisture (Unscented). If you are combining soaps/lotions/lip balms/face moisturizer make sure your total shipping is no more then $14.00, as a LOT will fit in the large box! 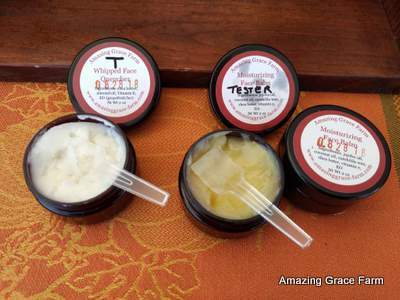 Amazing Grace Farm has spent a lot of time developing a face moisturizer! 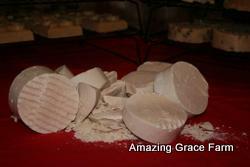 We were tired of spending lots of money on face products that were full of questionable ingredients. We wanted a gentle lotion full of pure goodness, and that's exactly what we created. Our moisturizers were tested by volunteers with various skin types and conditions including eczema, acne and oily skin so that we could be sure it would not cause clogged pores or breakouts. We know you'll fall in love with our nourishing new product as much as we have! We have 'Whipped Quencher,' an airy Argan Oil based formula great for day use and the 'Face Balm,' a thicker Jojoba Oil based formula perfect as a night creme. Both are appropriate for all skin types. Make sure to start with a clean face before applying!